Neuman was born in the small, northern Idaho mining town of Kellogg in 1926. After returning from the Air Force after World War II, Neuman became aware that much of American history had taken place in the Northwest, with key figures such as Lewis and Clark, Chief Joseph and Sitting Bull. Neuman says, “As I matured as an artist, I came to the conclusion that no one had related to the Western landscape of this country using the abstract visual language.” Using his intimate experiences (both literal and visually), Neuman started to create the Lame Deer Series with contemporary visual language that pays homage to the plight of the Native American people of the Great Plains. Neuman titled the works Big Eagle, Yellow Tail, Greasy Grass, and Shoshone highlighting historic chiefs, battle sites and tribes. The Lame Deer Series, started in 1978, was conceived during the artist’s visit to the Crow and Northern Cheyenne reservation in Lame Deer, Montana, named for a mystic and medicine man. The paintings also recall Mr. Neuman’s Western heritage as a native of Idaho who spent time fishing and hunting in Montana. 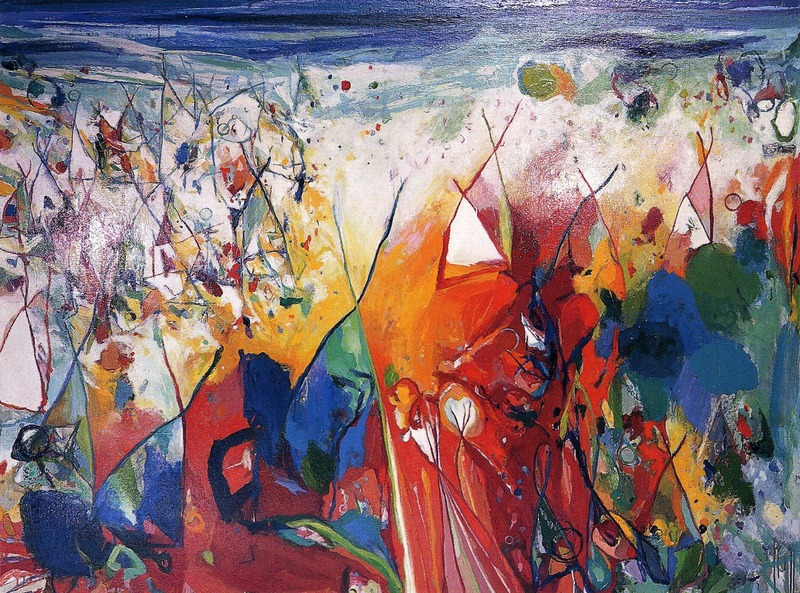 Reviewing the Lame Deer Series, art critic Robert Taylor wrote in the Boston Globe (March 25, 1979): “Neuman’s pictures fuse the methods of color field paintings, emblematic abstractions and expressionist responses and, at their best as in this series, are evocative and original.” Featuring bold, abstract tipi shapes, vast skylines and striking imagery, the Lame Deer Series is one of Neuman’s most personal series and one that he continues to work on to this day.